A handsome plant, decorative and curious in form and unusual in coloring. It is from one to four feet tall, with a stout, leafy stem bearing three to ten flowers and smoothish leaves, with prominent veins. The sepals are reddish or greenish-yellow and the petals pinkish, veined with maroon. 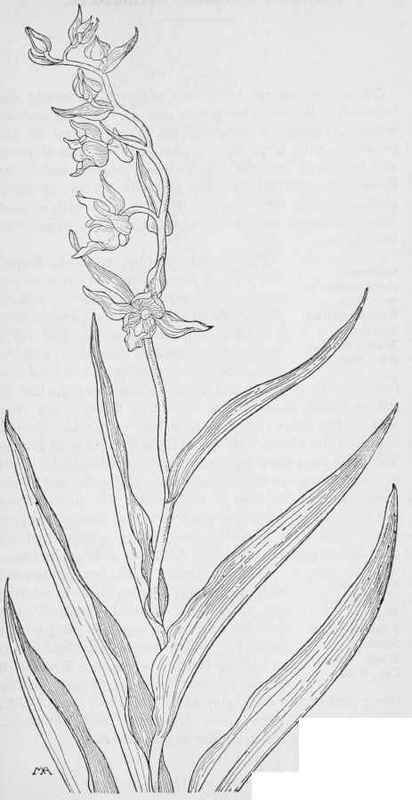 The lip is pouched at the base, with a winged margin and a pendulous tip, which swings freely as if on a hinge, so that it quivers when the plant is shaken. Although the flowers are very handsome this curious tremulous motion, which makes them seem almost alive, gives them a quaint likeness to an old woman in a sunbonnet, with a hooked nose and chattering jaw. They have a slight scent and the plant is quite common along streams and in wet places, in the West and in Colorado and Texas. Some botanists think it is identical with a variety which grows in the Himalaya Mountains. It was named for the Egyptian deity, Serapis. Stream Orchis- Serapias gigantea. ORCHID FAMILY. Orchidaceae. There are several kinds of Corallorrhiza, widely distributed in the north temperate zone and growing in dense woods; pinkish or straw-colored plants, more or less parasitic, with large roots resembling branches of coral; the leaves all reduced to sheathing, papery scales; the flowers in terminal racemes, without bracts, on short pedicels, which turn down in fruit, mostly with a short spur, the sepals and petals about equal, the upper ones curving in.